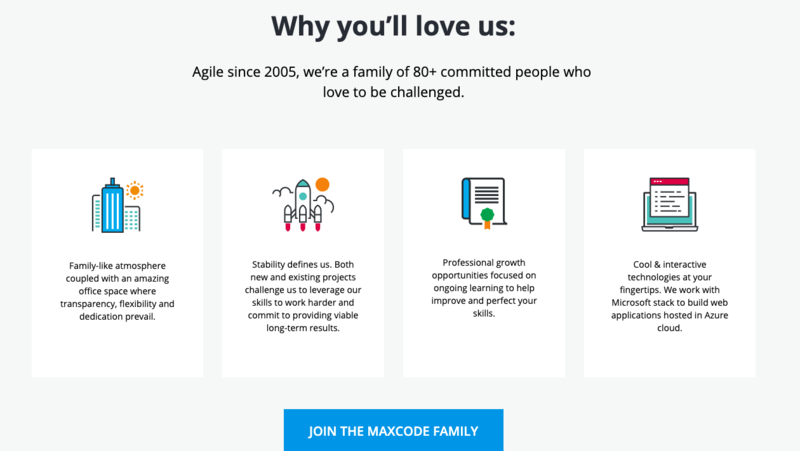 Maxcode, a Dutch company with a Romanian spirit, is a software development company with an approach to software development that caters to web, desktop and mobile solutions. The company provides scalable architectures that incorporate cloud services and complex business processes. Our goals for the “We are family” campaign was to create an awareness bubble around Maxcode and the incredible working opportunity that they provide; as well as generate leads (people who have applied for the advertised positions from the landing page) who will become suitable hires for their open positions. The creative concept of the campaign was to find a way to bring out the family-like atmosphere within Maxcode. We came up with an idea to instil a sense of friendliness and safety by focusing on the core principles of the company: stability, professional growth, access to cool & interactive technologies, and an amazing office space. Following the “We are family” campaign in April, where our main focus was to increase Maxcode’s awareness, we kickstarted another campaign with a more precise goal: to promote an exclusive conference organized by Maxcode, and generate actual leads for the company’s available positions on the .NET technologies. Following the completion of both campaigns, we managed to help Maxcode achieve its goal to recruit qualified people for their available positions in the numbers. In terms of numbers, 100+ attendees joined the conference and 20+ expressed an interest to join the Maxcode family.